As protests outside Puducherry Raj Nivas escalated into a ruckus on Thursday, the Union Territory’s Lt Governor Kiran Bedi slammed Chief Minister V Narayanasamy asserting that she had written to him stating that she would meet him on February 21 as she is currently on tour. Bedi also accused Narayanasamy of stalling the steps to ensure the implementation of wearing the helmet rule for two-wheeler drivers. “I wrote to him (Puducherry CM) a letter that ‘you are welcome to come and see me on February 21 at 10 am, as I’m on a tour till February 20 starting today. I’ll return on February 20 midnight and tell me what could be more right. He is still sitting there. He isn’t allowing people to wear helmet,” said Bedi. “He (CM) wrote me a letter on February 7 on 36 issues some of which don’t exist or have been settled. I received it on February 8. Yesterday he sits on a dharna saying he demands a reply. The letter didn’t say that ‘if you don’t reply by February 13, I’ll sit on a dharna,” she added. Narayanasamy’s protest came after Bedi hit the road several days ago and advised two-wheeler owners to wear helmets. While Bedi wanted the helmet rule for two-wheeler riders to be implemented at one go, Narayanasamy wanted the implementation in phases. Narayanasamy and his ministerial colleagues continued their dharna outside the Raj Nivas for the second day on Thursday protesting against Bedi’s “negative stand” towards his government’ proposals awaiting her approval. Functionaries of different wings of the ruling Congress and the DMK have also joined the protest. 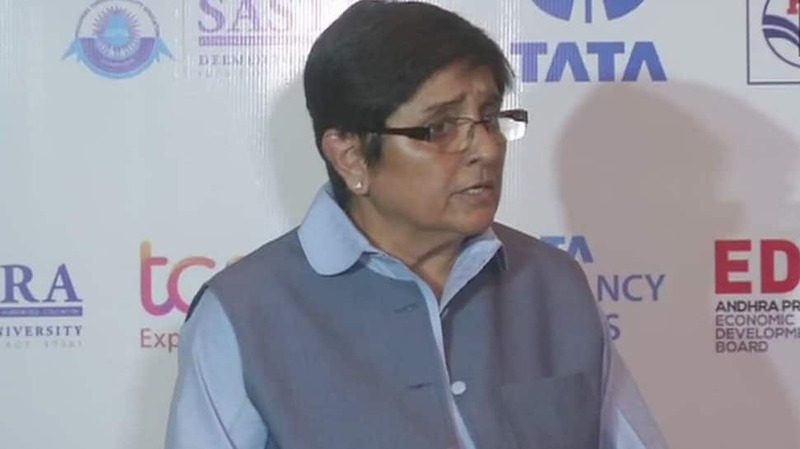 Bedi left for New Delhi early on Thursday morning under tight security of the Rapid Action Force (RAF). On the helmet rule, Namassivayam said the government had asked the police not to be very stern against those not using helmets while driving two-wheelers as awareness needs to be raised at least for a month before making the wearing of helmets compulsory. He, however, clarified that they were not against the helmet rule as the Supreme Court’s directive to implement the rule should be complied with by all.